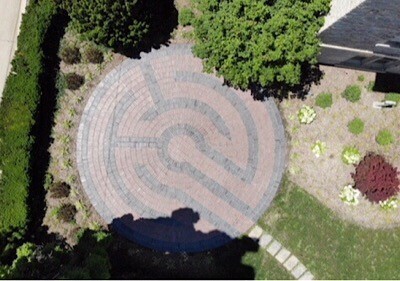 Everyone is invited to walk our labyrinth. Any time. Any day. It is outdoors, nestled in our garden. Shaded in the daytime and well-lit in the evening. Made of bricks, it is level and smooth - easy to walk. Made to fit the city space we have, it is quite a bit smaller than the medieval labyrinths on which it is modeled. Nevertheless, the walking is still soothing, inspiring, and can help you walk your way into newness of insight and understanding. If you’d like a formal introduction to walking the labyrinth, we invite you to our Bicentennial Open House on Sunday, September 16th at 4 o’clock in the afternoon. New to the spiritual practice of a labyrinth? Here are some resources. labyrinthlocator.com has an international list of labyrinths. There are 142 listed in Ohio from Akron to Zanesville. Veriditas (Veriditas.org) is a non-profit organization founded by the Rev. Dr. Lauren Artress and dedicated to fostering the use of labyrinths around the world. As Canon for Special Ministries at Grace Cathedral in San Francisco, Dr. Artress rediscovered the ancient tradition of labyrinths while in France on sabbatical. As the website notes, "Lauren not only introduced the walking meditation back into the Christian tradition but also introduced the labyrinth back into Western culture." Come and walk our labyrinth - any time. We have prayer cards that offer a simple way to begin. Like every spiritual practice, all we have to do is make a beginning. And then practice. May you be blessed in every step you take. May you be blessed wherever you go. May you be blessed by knowing God’s presence. Bless all who walk this Way. may it be a path of prayer for you. may it be a path of stillness for you. may it be a path of gratitude for you. may it be a path of mystery for you. may it be a path of courage for you. may it be a path of healing for you. may it be a path of forgiveness for you. May you know Life and Resurrection.